When it is time to service or repair your Honda MSX 125 Grom, you surely need the right set of tools. 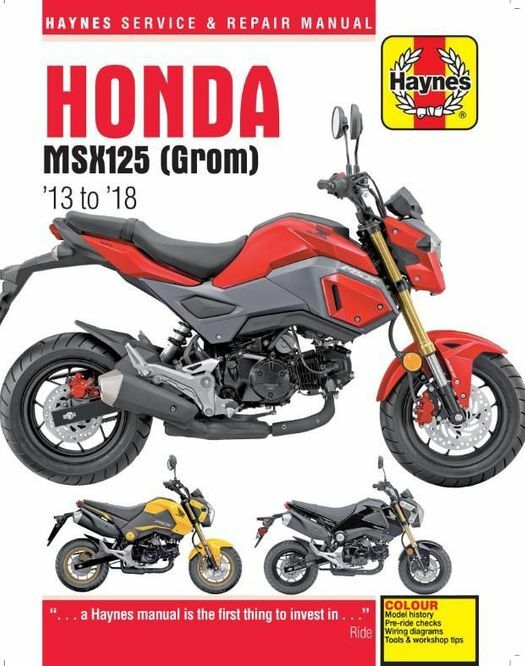 The Haynes M6426 - Honda MSX125 (Grom) Repair Manual (2013-2018) is the number one / RIGHT tool that you should grab first. 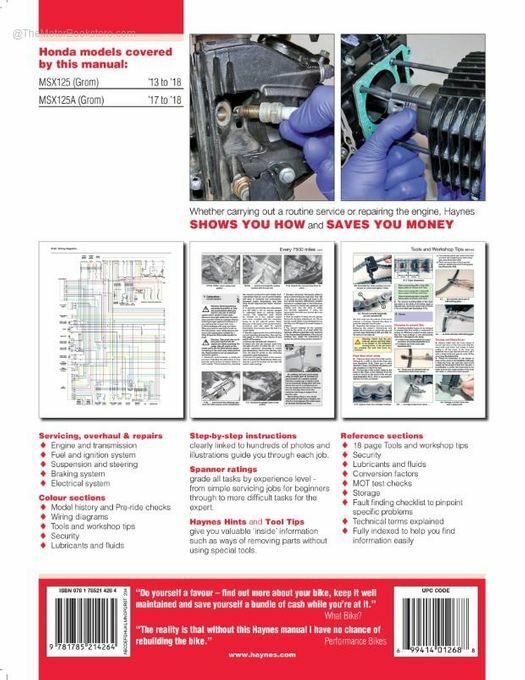 A Haynes manual is second to none when it comes to providing authoritive DIY step-by-step procedures and instructions for repair and rebuild projects on your Honda MSX bike. In addition to clear and concise textual descriptions of the necessary service procedures, you will find excellent photos, diagrams and charts to clarify the detailed service procedure steps in this service guide. This Honda MSX125 service manual includes color wiring diagrams. 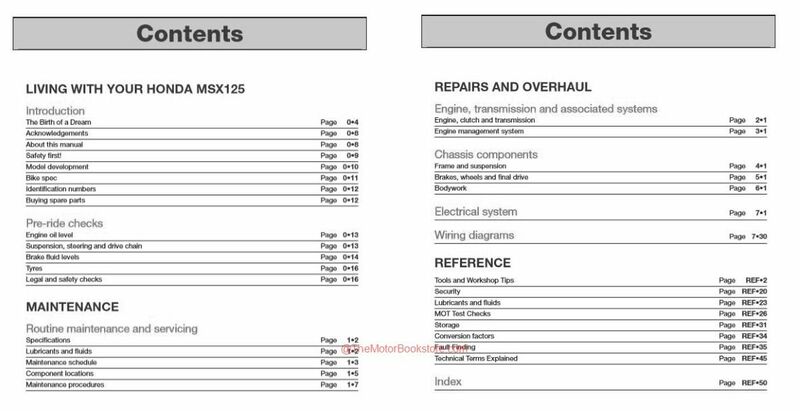 The Haynes Honda MSX125 repair manual is based on a complete teardown and rebuild of the bike in the Haynes shop. 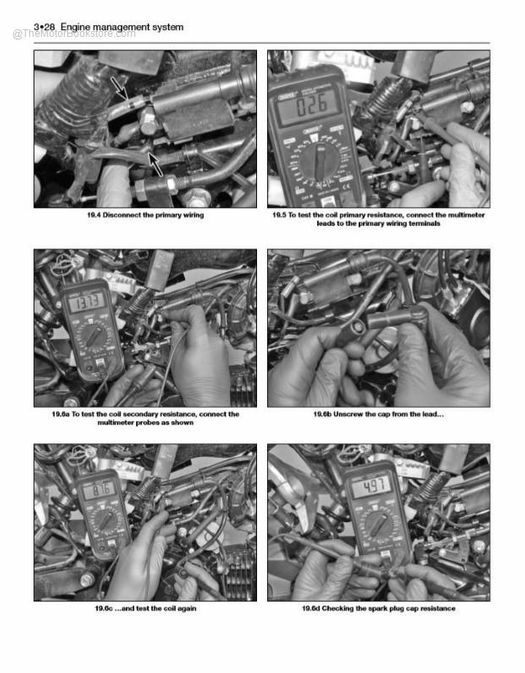 Technicians, photographers and DIY experienced writers capture all of the assembly and disassembly instructions while providing experienced strategies and tips to save you headaches in addition to money. You can feel confident with this manual in your hand that you can tackle simple to complex repair, service and rebuild jobs yourself. Why spend the high dollars it would cost to take your bike to a Honda dealer when you can do the work yourself. You will have fun and take additional pride in your machine when you repair the bike yourself. If you prefer to take your Honda MSX125 to the shop, this book will help you communicate intelligently with the Honda mechanic. Either way you will save money because knowledge is power when it comes to mechanical repairs and service. 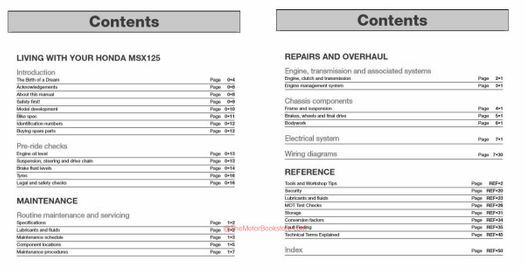 Ask a question about Honda MSX125 (Grom) Repair Manual 2013-18.